Webster's Dictionary defines "unequivocal" as "leaving no doubt: clear, unambiguous," or "unquestionable." That's how I've always used the word, but after Rep. Ilhan Omar (D., Minn.) "unequivocally apologized" for a series of anti-Semitic tweets, I had to make sure I hadn't missed some alternate definition. Omar was of course right to apologize. To recap, she accused House Minority Leader Kevin McCarthy of supporting Israel because it was "all about the Benjamins," and when asked who was bribing him, responded "AIPAC!" The American Israel Public Affairs Committee doesn't even donate to campaigns, it should be noted. 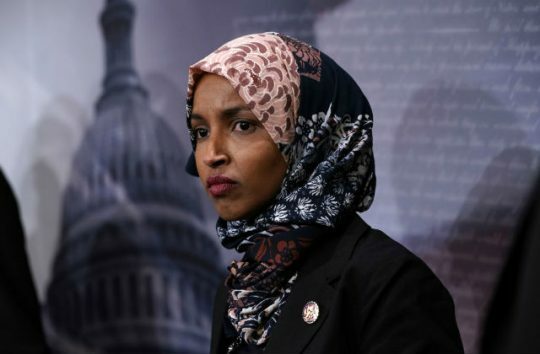 Even if you're inclined to stick your head in the sand and ignore the clear anti-Semitic undertones of politicians being slaves to Jewish money, Omar accused a sitting congressman of voting certain way because he was bribed by an organization, when in reality they've never given him a dime. She smeared them both, plain and simple. At the same time, I reaffirm the problematic role of lobbyists in our politics, whether it be AIPAC, the NRA or the fossil fuel industry. It's gone on too long and we must be willing to address it. Call me crazy, but the "unequivocal" apology seemed equivocal from the get-go. "At the same time" is of course another way of saying "but," and everything before the word "but" is usually filler. Most apologies do not end with an insistence that the people you wronged are still the bad guys, or with promises to continue attacking them going forward. That impression has deepened as the week has continued and Omar has telegraphed time and time again that she is not particularly remorseful about the remarks that she unequivocally apologized for. For starters, there was her bizarre and unreasonable reaction towards CNN's Manu Raju when he asked a question Wednesday outside her office about President Donald Trump's attack on her apology, and Omar's subsequent retort. "Are you serious? What is wrong with you?" she snapped. "Yes, I tweeted and there’s a response. You can run that. Have a nice day." "What is wrong" with Raju is that he is a reporter, and reporters' jobs are often to ask our representatives to expound on their previous statements. People who unequivocally apologize typically have no problem doing so, while people who are forced to give insincere apologies will bristle. The same day, Omar supporter Katie Halper posted a video of her appearance on Fox News attacking AIPAC and insisting there was "nothing anti-Semitic" in Omar's initial remarks. Omar responded with the raised fist emoji, a universal sign of support. Why exactly is Omar supporting a line of argument that she has discarded? Why is she defending herself at all on something she has unequivocally apologized for? Lastly, Jewish Insider Executive Editor Adam Rubenstein noticed that Omar is fundraising on Facebook off the anti-Semitism row, writing "we will not be silenced." Now see, if it were me, and I had unequivocally apologized for something and admitted it was anti-Semitic, I wouldn't try to earn money off it. But hey, I guess it's all about the Benjamins. This entry was posted in Politics and tagged AIPAC, Anti-Semitism, CNN, House Democrats, Ilhan Omar, Twitter. Bookmark the permalink.